Already have this plugin? You can view documentation here. 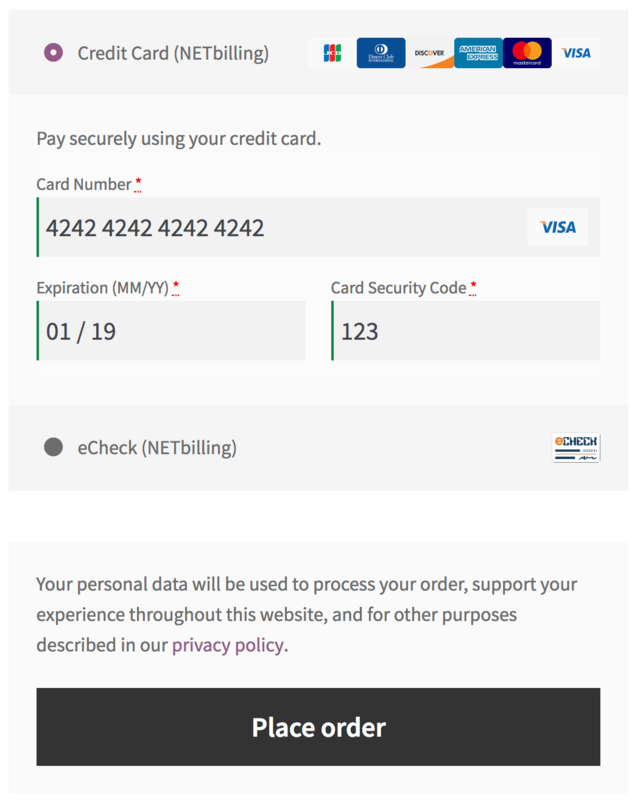 The NETbilling payment gateway extension provides one of the most advanced integrations for WooCommerce while providing security and reliability for payment processing. Let your customers save their credit cards and bank accounts to their WooCommerce account for fast and easy checkout. Includes full support for WooCommerce Subscriptions and WooCommerce Pre-Orders. The NETbilling gateway also features numerous real time reporting features that allow merchants to continuously monitor sales conversions and analyze profits through ROI tracking. The NETbilling extension allows you to keep the customer on your site for the checkout process, allowing you maximum control over checkout so that you can test and implement the most effective experience for your store. An SSL is required for PCI compliance due to the direct checkout to ensure that your customers’ credit card information is secure. You also need a merchant account to use NETbilling’s payment processing services. Your hosting provider must have the ability to open port ‘1402’ in order to integrate with the NETbilling Gateway. Customers can easily & securely save multiple payment methods to their account for faster checkout. 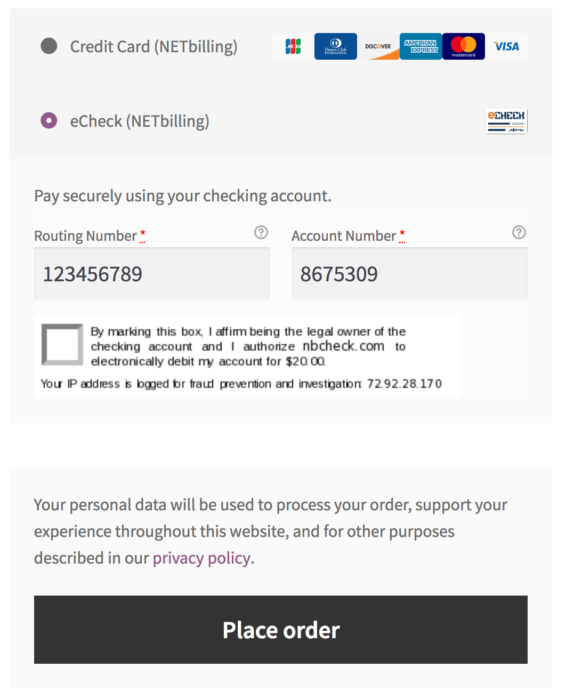 Payment data is stored on NETbilling’s secure servers (if enabled in your NETbilling account), so your responsibility for PCI compliance is significantly reduced. There’s no limit to the number of payment methods a customer can store on their account, and both credit cards and eChecks are supported. 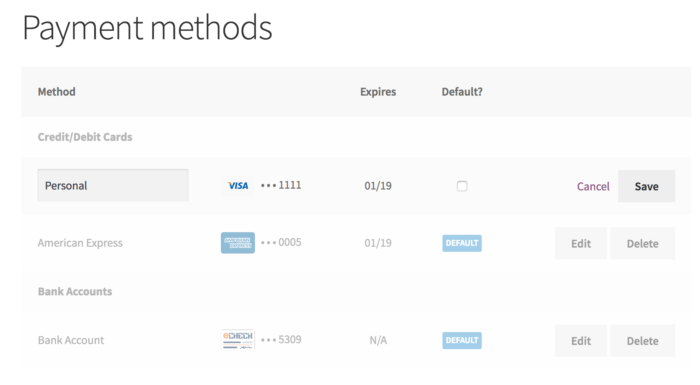 Customers can change their default payment method and remove payment methods from the My Account page. 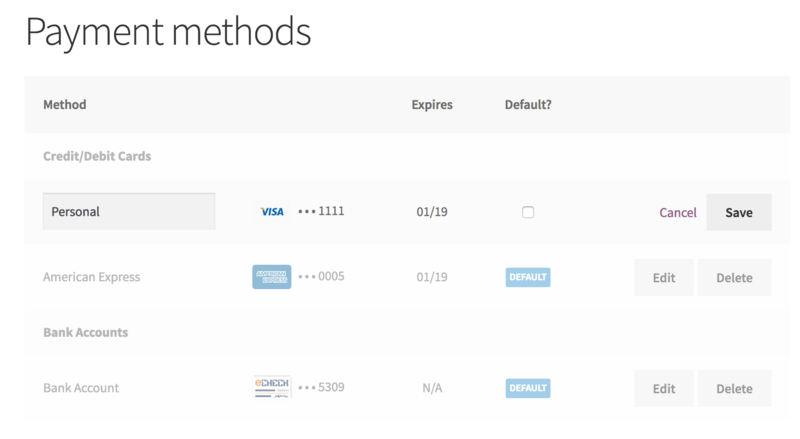 They can also set nicknames for saved payment methods, making them easier to use in future purchases. Some users choose to set the payment gateway to only authorize charges rather than authorize & capture them. However, this requires the user to then log into the payment gateway admin to capture charges. This extension allow you to optionally capture previously authorized transactions directly from the WooCommerce Edit Order screen rather than logging into your gateway control panel to do so. Simply edit the order, select the “Capture Charge” action, and charges will be captured through NETbilling. 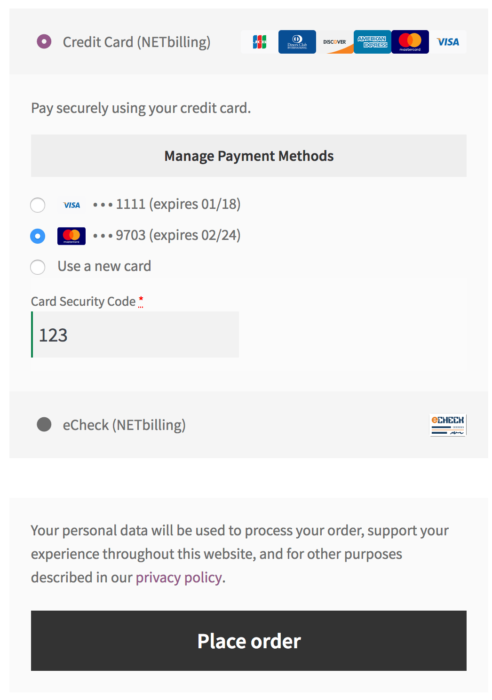 Using the NETbilling extension allows you to decide what your checkout process will look like, while keeping the customer on your site for the entire process. This gives you maximum control over this experience, providing a slick checkout process for the user and maximum customizability for the business owner. 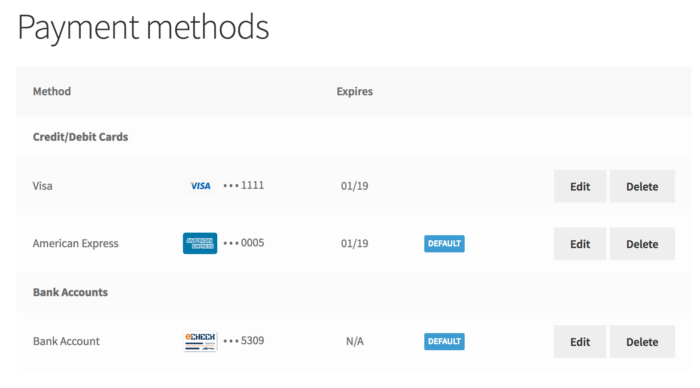 Customers can even use previously saved payment methods. Customers with US bank accounts can checkout using their bank account information. Bank accounts can be securely saved to the customer’s account, which allows them to be used with Subscriptions. To use this feature, you must have an active NETbilling eCheck account. NETbilling is an ideal gateway for WooCommerce Subscriptions, offering support for all Subscriptions features – payment date changes, subscription date changes, and more. Even better, customers can sign up for subscriptions with a credit card or using eChecks! 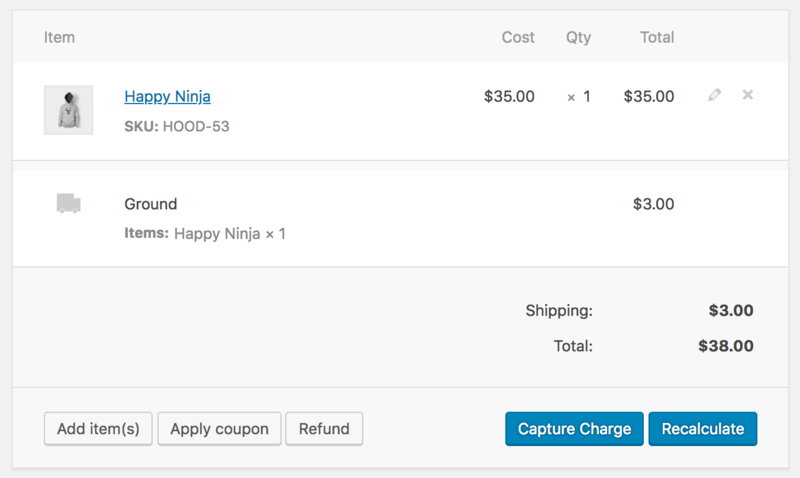 The gateway also fully-supports WooCommerce Pre-Orders, so you can take customers’ payment information upfront and then automatically charge their payment method once the pre-order is released. Your hosting provider must have the ability to open port ‘1402’ in order to integrate with the NETbilling Gateway. Please confirm with your hosting provider that this is possible.